Movie: "I Am Chris Farley"
Friends and family talk about the life, career, and death of famed comedian Chris Farley. BigJ and I were huge fans of Chris Farley. Every single time he was on Saturday Night Live, he made us laugh. His movies? We love them and him, even to this day. He was such a funny guy, and we were really sad when he passed away, just like everyone else was. It wasn't until I became older that I realized how he died. 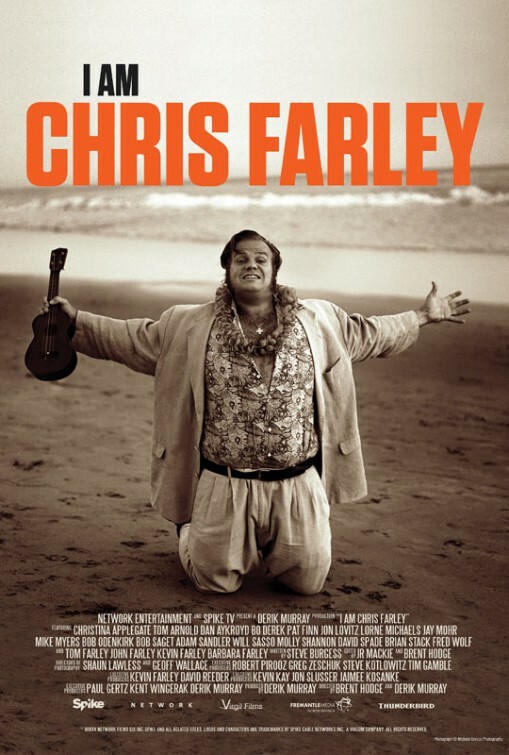 "I Am Chris Farley" spends as much time as it can celebrating the life, love, and hilarity of the beloved comedian with a minor emphasis on his death towards the end of the film. Within the first few minutes, it will have you crying a few tears from reflecting on what a presence he was in both comedy and life itself. Speaking to friends in the business, such as Mike Myers, David Spade, Bob Odenkirk, Molly Shannon, Tom Arnold, Will Sasso, and Dan Aykroyd, as well as his brothers and other family members, the people interviewed in this documentary reflect on a man who had so much love in his heart, such a big spirit, an enormous drive and want to have anything and everything, that his short life eventually succumbed to his demons. The audience gets a chance to learn about Farley before he was famous while he was performing improv and pre-SNL. We learn about his apprehensions with fame, his coming to terms with his looks, his humor and his place as a larger man on television, and how he learned to cope being in the limelight. While it is sad to watch this film knowing he has passed on, it was also heartwarming, too, knowing Farley often did charitable work without acknowledgement and without being front and center in the headlines, clamoring to a 90's style-TMZ for attention. He was devoted to doing good in his life and hearing those closest to him contemplate this was touching. It doesn't shy away from his darker side, though, and unfortunately, on a similar note but with the opposite effect, we had no idea Farley had gone to rehab over a dozen times. He actively tried to contain his drug addition, alcoholism, and love of food so many times, they eventually won and ended up taking his life. On a technical note, the music in this documentary is absolutely horrible. It sounds very canned and campy, almost after school special-like, and rarely, if ever, fits the scene for which it was intended. This takes a little bit away from the film as a whole. It also relies on the same clips, which play over and over juxtaposed between and next to interviews of his friends and family speaking. I'm not sure how this could have been rectified, but it was also distracting. Obviously not without its flaws, "I Am Chris Farley" is the best way to get to know the man behind the jokes. We miss him a lot and wish there were more comedians out there like him now. The world has a Chris Farley shaped hole that will never be filled and this documentary proves it. One year ago, we were watching: "Unfinished Business"